Six months after, Apple has announced the launch of a special edition of iPhone 7 and iPhone 7 Plus (PRODUCT) RED iPhone and will be available to order online worldwide and in stores beginning Friday, March 24. 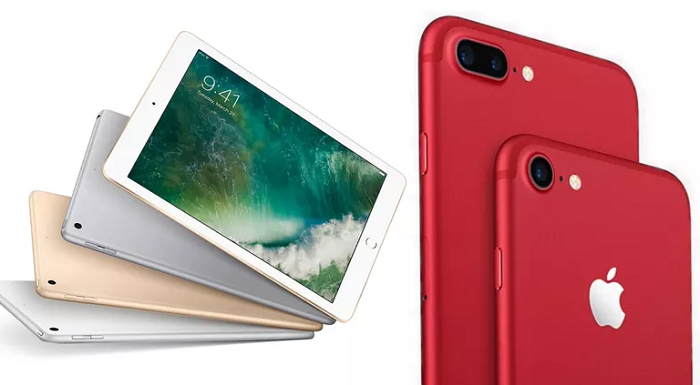 The vibrant red aluminum finish phones are in recognition of more than a decade-long partnership between Apple and (RED). The (RED) campaign will give customers the opportunity contributes to the Global Fund to fight AIDS. “The introduction of this special edition iPhone in a gorgeous red finish is our biggest (PRODUCT)RED offering to date in celebration of our partnership with (RED), and we can’t wait to get it into customers’ hands,” he added. According to Deborah Dugan, (RED)’s CEO, Apple is the world’s largest corporate donor to the Global Fund, contributing more than $130 million as part of its partnership with (RED). “Combining the global reach of the world’s most loved smartphone with our efforts to provide access to life-saving ARV medication in sub-Saharan Africa, customers now have a remarkable opportunity to make a difference and contribute to the Global Fund through the purchase of this new beautiful (PRODUCT)RED iPhone,” she said. Apple’s new version of its 9.7-inch iPad. Apart from cooking up red iPhones, Apple also announced a new version of its 9.7-inch iPad. And just in case you’re waiting for a new name like iPad X or iPad Mega or anything like that, you’ll be disappointed as the new tablet is called iPad. Yup! Just iPad. The iPhone 7 and iPhone 7 Plus (PRODUCT)RED Special Edition will be available in 128GB and 256GB models starting at $749 (US) from apple.com and Apple Stores, and from Apple Authorized Resellers and select carriers (prices may vary). The special edition (PRODUCT)RED iPhone joins iPhone 7 finishes in jet black, black, silver, gold and rose gold. The new tablet, which is $70 cheaper features a brighter display and faster processor. The iPad also features A9 processing chip and up to 10 hours of battery life. It will be available to order on March 24. Both special edition models are available worldwide beginning Friday, March 24 and start shipping to customers by the end of March in the US and more than 40 countries and regions, including Australia, Belgium, Canada, China, France, Germany, Hong Kong, Italy, Japan, Mexico, Netherlands, New Zealand, Russia, Singapore, South Korea, Spain, Sweden, Switzerland, Taiwan, Thailand, the UK and United Arab Emirates. Brazil, Chile, Colombia, India, Turkey and other countries will follow in April.